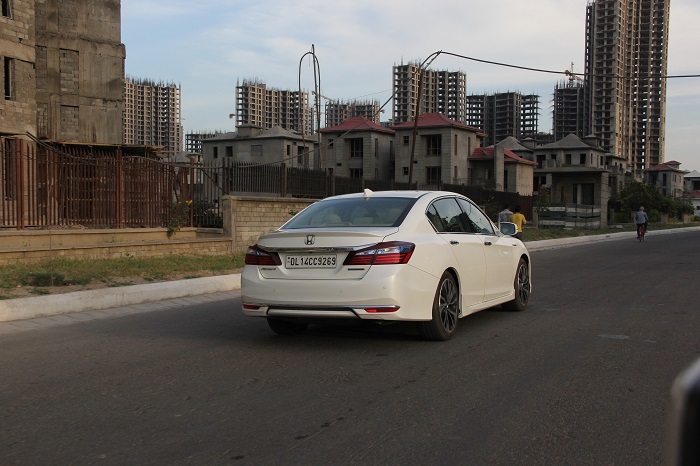 Use of Hybrid Technology in a premium sedan like the Honda Accord just goes to show how much of a progress we as nation have made towards a greener environment. Will this thought be enough to make a convincing impression in the mind of an average consumer is what we are here to find out? Honda Car India isn’t the only one who took a conscious decision to go the Hybrid way; manufacturers like Toyota, Maruti Suzuki did their fair bit as well with Camry and Ciaz Hybrids. However last year this story swindled the wrong way courtesy government policy that introduced a uniform tax called GST. Under the new GST regime, hybrid vehicles attract a tax of 43 percent while electric vehicles are taxed only 12 percent. Which means that despite Hybrid vehicles being more conducive to Indian conditions, it was the electric cars that were being given a push (India’s electrification plan of cars by 2030). Be it Hybrid or electric the promotion of both is highly debatable. However the reason that we are here today is to bring for you the benefits of using a hybrid, which in this case happens to be the Honda Accord. Introduced last year, there aren’t many of them around simply because the price of such Hybrid’s has shot up drastically and therefore the current pricing starts at INR 43.21 lakhs (ex-showroom). 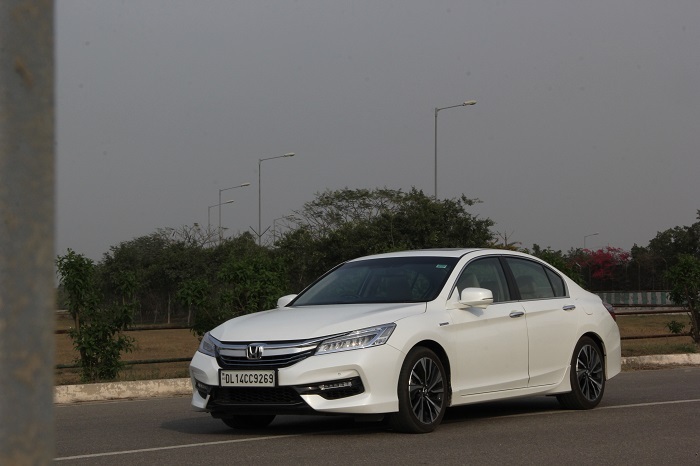 This in comparison to what the initial prices where for the Accord (INR 22 – 30 lakhs) is a lot more. Then off course there is that fact in such a price range one can actually go in for any of the German trio – Audi, BMW and Mercedes Benz. But then again they’re those who are loyalist and this review is to demonstrate that the Honda Accord Hybrid is no less either. Speaking of loyalist, I have had the opportunity of spending a decent time with the previous generation Honda Accord and to be able get my hands on the new one was just a matter of time. Though let me remind you that I have driven the new Honda Accord Hybrid earlier during the media drive but this time around the purpose was the check its viability on a day-to-day use. In profile, the Honda Accord Hybrid is a looker for its exterior design. The daytime running lights provide it the curiosity that can be seen in the eyes of on-lookers wanting to know what car it is. In your face chrome finished grille upfront and a heavily worked bumper help in this cause. Culmination of white and black plastics further adds substance. A glance to the side, the first thing that catches one’s attention is the presence of 18inch diamond cut alloy wheels, skirting on either side and a Hybrid badge that states its credentials. Unlike the front, the rear of the Accord is very subtle featuring LED taillights, a boot lip, sharp creased bumper with reflector inserts on either side. 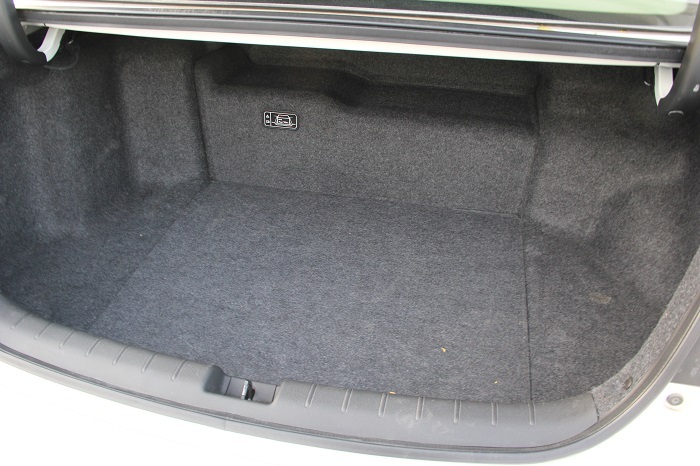 My most favourite part of the Honda Accord has been its cabin and therefore I was looking forward to spending some real quality time in it. Like all Accord’s this one too is right up there with the kind of features it has to offer. Dual tone (beige and black) makes the interior feel very much premium and so does the presence leather seats. As expected, the dash of this one is new and updated. 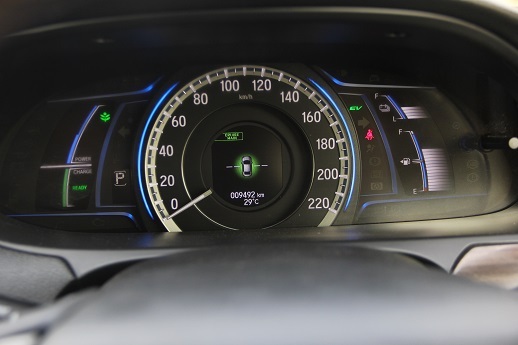 The instrument cluster for that instance has a new dial (speedometer) alongside digital fuel and temperature meters. 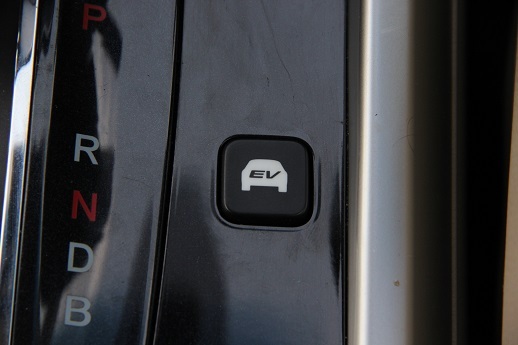 Though what is worth making a note out here are the EV (electric) and Eco Mode indicators. 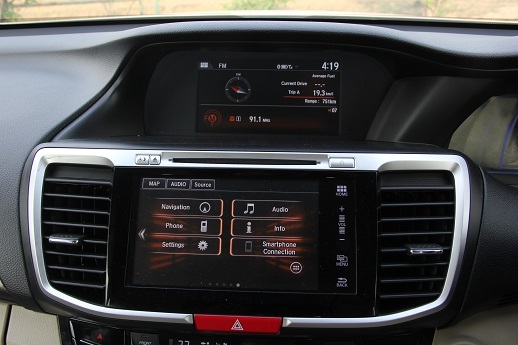 For the first time, Honda has given two screens – on top is a 7.7inch TFT i-MD (intelligent multi-information display) below which comes a 7inch Advanced Display Audio with High-Resolution WVGA (800×480) Captivative Touch-Screen. The latter is compatible with smart phone connectivity like Apple Car Play and Android Auto. Combination of speakers, tweeter and a sub-woofer are able to further enhance on-board experience by way of superb sound quality for the music being played while on the move. This system also doubles up as a satellite linked navigation that provides precise directions when fed into the system. Adding in 2 USB ports just goes to that Honda have left no stone un-turned to please the end consumer as there are a 1.5 AMP charging port upfront with a 1.0 Amp charging port and an HDMI port in the center console. For keeping the cabin cool at all times for its occupants, there is i-Dual Zone Automatic Climate Control system. What this system actually does is that it adjusts the temperature and volume of air depending on the strength and direction of sunlight. Brilliant isn’t it. On top of that, to ensure that one gets totally fresh air to inhale there is Plasma Cluster that works exceptionally to keep pollutants out of the car. Despite lying low, the seats are I must say are very comfortable like what they have been in the past. However at this price point the inclusion of massage seats would have been the perfect icing on the cake. Though there are a couple of things which make the overall experience a memorable one out of which the most prominent is the side-view camera located within the left view mirror. It provides an exterior view of the car that comes in handy due to its vast length while negotiating turns especially in congested areas. There is a reverse camera as well but the clarity isn’t that great as the side view camera but it still does the job for you. 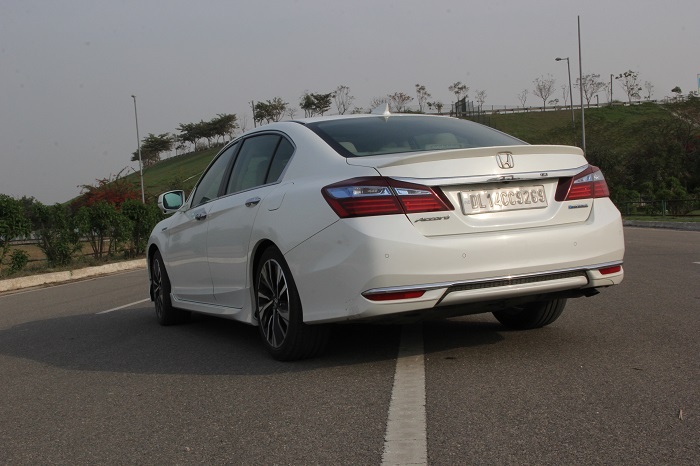 Now to the most important part of this review, how much of a difference is there in the New Accord. Unlike the petrol guzzler of the past, this one has a lot to look forward to. 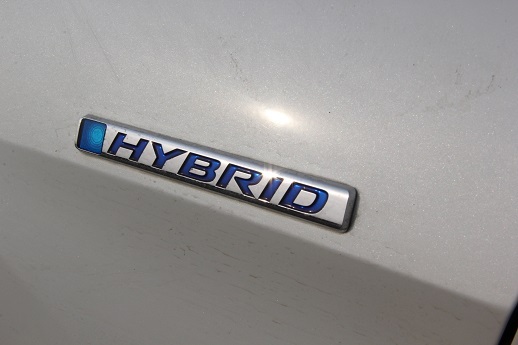 Firstly it is a Hybrid therefore the culmination of gasoline and electric motors promises to be highly efficient. But before we get to that, lets take a look at the specs shall we. 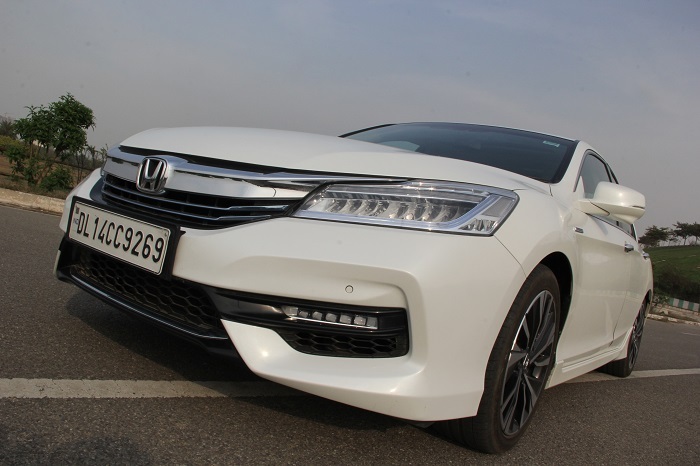 Honda Accord Hybrid therefore caters to a 2.0 litre DOHC i-VTEC Inline 4-Cyclinder Atkinson Cycle petrol engine that in its gasoline state produces 145 bhp of power output with 175 Nm of peak torque. In addition to that, there are two electric motors on-board one of which is a propulsion motor that powers the wheels and other produces electricity. As a combination, the petrol engine and electric motors deliver a maximum power output of 213 bhp. How does this all work? Well switch on the ignition and this Hybrid comes to life. The engine that begins on the electric mode is so silent that on many occasions one would wonder whether the engine is really on or off. That apart on sole electric, the Accord Hybrid can travel a distance of only 2 kms which is very less to what one would ideally have expected. But then again this is just the beginning for such type of technology to be induced into a market like India. In order to market this sedan, Honda refers to the Accord as a Sports Hybrid that provides three different driving modes namely – EV Drive, Hybrid Drive and Engine Drive. The EV Mode we have already explained above but in a single sentence it is only optimum for a really short distance while the Hybrid mode swings into action the moment the vehicle starts to gain some speed. 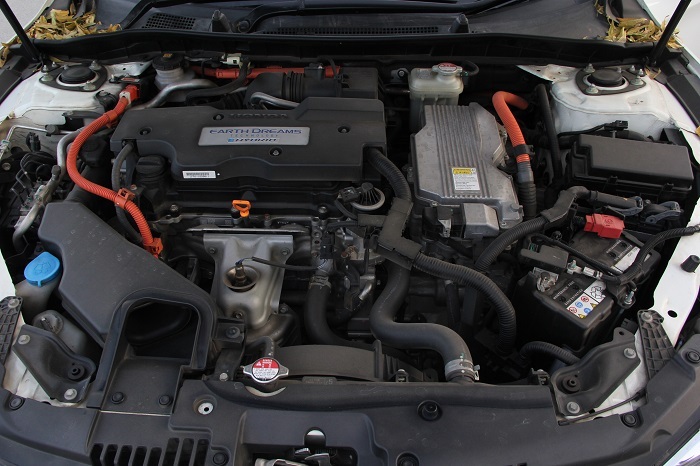 In such a situation, the gasoline engine acts as a generator thereby providing electric power to the Hybrid batteries that in turn supply power to the electric propulsion motor. Whereas in the Engine Drive Mode, it’s the 2.0 litre power plant that takes over once the car has been able to achieve medium or high-speed. To put all this power to effective use, Honda Accord Hybrid offers an Electric Continuously Variable Transmission (E-CVT). This particular transmission is very unlike a conventional CVT. In a normal case scenario the transmission offers a torque converter alongside a mechanical pulley however in the case of E-CVT both these components are non-existent. Which means that the gearbox is able to control the engine and electric motor at the same so as to deliver better fuel efficiency. 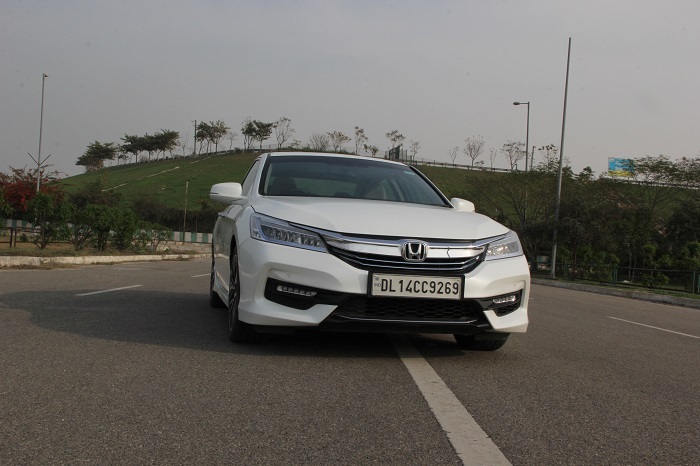 Talking of which, Honda Car India claims a mileage of figure of 23.1 kmpl that is unheard off from a past experience but when you actually start using this sedan in the city as well as on the highway you will be surprised to know that it does deliver on this promise. Besides the modes already mentioned, there a Sport Mode as well that provides a peppier response from the powertrain enabling the user to really enjoy the vehicle to full potential. Though while trying to achieve triple digit speeds, the engine does come across to be a bit noisy. How about the ride and handling? 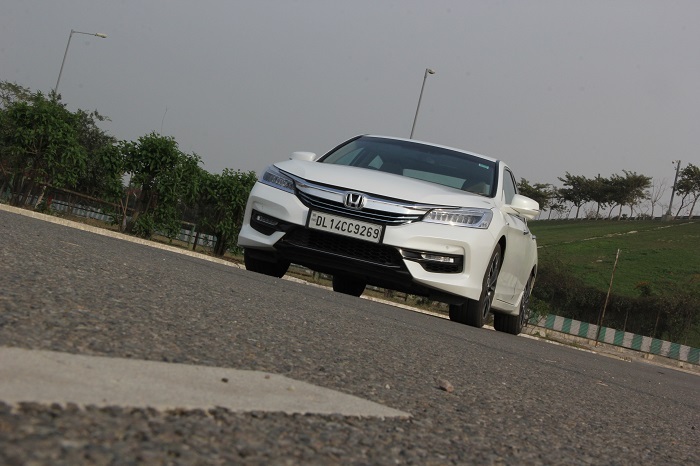 Honda Accord Hybrid comes fitted with 18inch alloy wheels that adorn Michelin rubber featuring a 235/45 section. These tyres provide decent amount of grip but are plagued with the fact that there is a high level of road noise that can be heard inside the cabin. To further ruin the overall experience a low ground clearance ensures that the driver needs to be cautious at all time to avoid scraping the under body against high but not forgiving Indian speed breakers. Having driven the car earlier (media drive), I was expecting certain aspects to change so therefore when it came to handling I must say that as stated before the Accord to my realization does handle well. It is pretty clean when it comes to tackling corners with minimum amount of body roll. Therefore one can safely say that despite throwing it around this particular sedan will hold its ground nevertheless. Is the New Honda Accord Hybrid worth a bet? For the kind of technology that this sedan has to offer, the answer would be a yes. The most important aspect is that in a segment that is dominated by diesels, this one goes beyond anyone’s expectation especially when it comes to the fuel efficiency. There are quite a few upgrades that would preferred by most Honda loyalists and more over the whole idea of going green is what would matter at the end of the day. 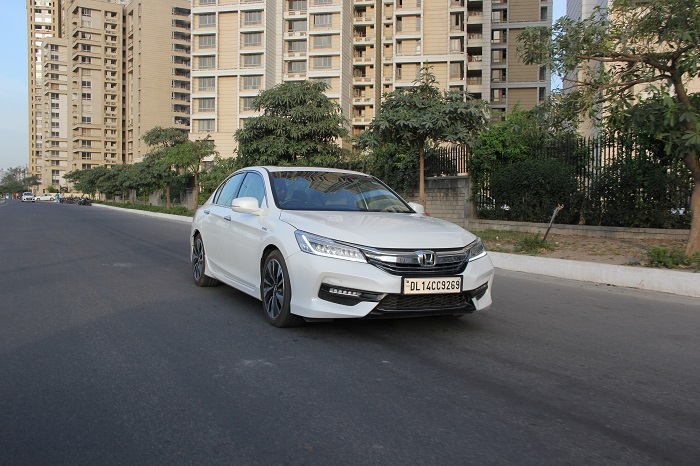 For us city dwellers a style statement is incremental, though with a little help from the Government of India the Accord could be a well-scripted answer to the German trio.